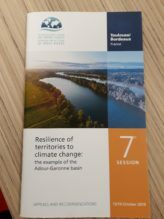 In October, IFGR brought together its experts for the 7th session at Toulouse and Bordeaux on the theme: “Resilience of territories to climate change: how can the need for water be reconciled with its availability? The example of the Adour-Garonne basin”. The report on the exchanges and recommendations formulated between the actors in the domain of water in this basin are available on our website. They are a major contribution to the second sequence of the Congress on Water currently organised by the French Ministry of Ecological Transition and Solidarity, aimed at better saving, protecting and sharing water resources in the context of climate change. Hello, I invite you to visit the following page, on the Initiatives for the Future of Great Rivers (IFGR) website :The report of IFGR’s 7th session is available https://www.initiativesrivers.org/actualites/the-report-of-ifgrs-7th-session-is-available/ Best regards.